One of the uses of FilePro snapshots is that you can compare those and review differences. You can also compare a single snapshot against the current disk state. order to see what files have been added, deleted, renamed, moved or updated. For help on how to create and manage snapshots, and more details see the separate topic "Snapshots". As mentioned earlier a snapshot can be compared against another snapshot, or against a current directory. - left snapshot is always the older snapshot. 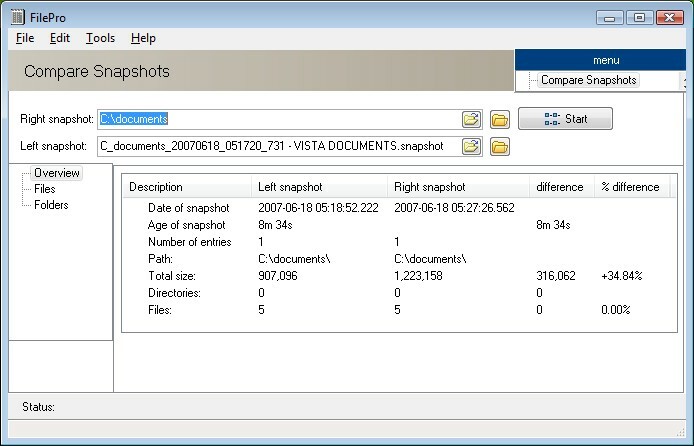 - right snapshot is either the newer snapshot or a directory. So the "left snapshot" box always accepts a snapshot whereas the "right snapshot" accepts a directory or snapshot. To do this we specify the "right path" to be the directory path, where the "left path" will be the snapshot. To easily select the snapshot from the disk click the "Select volumes" icon. For more details on the "select volume" dialog see see the separate topic "Snapshots"
Once we have specified the inputs we are ready to start the comparison by pressing "start". The first report you get once you compare is the overview report. Here you get side by side information about the "right snapshot or drive" and the "left snapshot". - Age of both snapshots in a human friendly format. To view differences in files, click the "Files" tab below the "Overview" tab. You can examine differences in directories in a similar way. The c:\documents directory has been updated, and has its size increased.